A blanket of fog rolled over the woodsy city of Baguio. As I meandered through the mist I was both offered a teaching job (Baguio’s also a popular destination for foreigners studying English) and a jeepney to the Tam-Awan Village. I chose the model village with Ifugao huts and Kalinga houses. 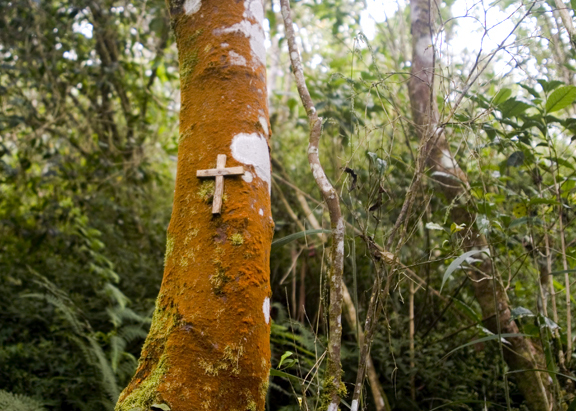 The raised structures had thatched roofs and wood flooring smoothed over time by the patter of bare feet. Dirt paths connected the huts and ran amongst a beautiful green landscape. 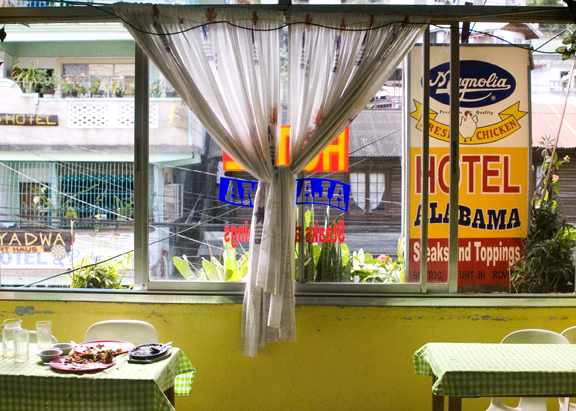 Baguio is also an excellent city for dining. In the center of the city was a vegetarian café called Oh My Gulay. It is in a sunny atrium, overrun in the courtyard with plants. The décor is eclectic and the second level terrace, made with bits like ship hulls and found wood, resembles a child’s dream treehouse. 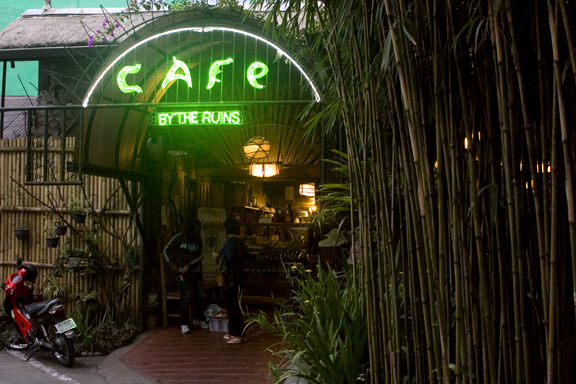 However, Café by the Ruins was the best food we had in the Philippines and the reason we detoured through Baguio a second time. 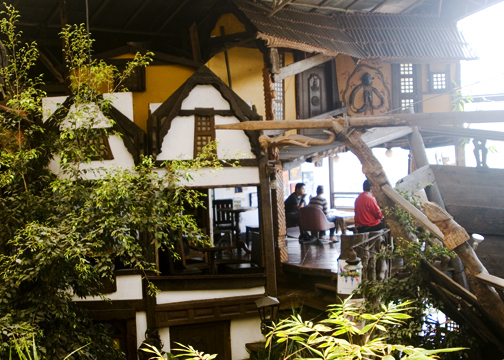 The café’s name is a nod to the original building on the property-the house of the first governor of Baguio. All that remains today is a solitary wall that has been incorporated into the structure of the restaurant. When the traditional tapuey wine began flowing by candlelight the mood became dangerously romantic. Though my senses were dulled, the ladyfinger curry I ordered cut through the alcoholic fog with warm coconut sauce infused with coriander, chutney and papadum. The lemongrass ice tea slowed my spinning world while the bibingka, a soft and spongy rice cake topped with brown sugar, coddled my sweet tooth. The price for a gourmet feast of local produce and homemade treats for two? $25. Amazing. The road through the Cordillera Mountain Range was lined with small terraced gardens- where anything (including gardeners) could roll off a cliff and into a canyon. Halfway through the trip we stopped and ate hot sisig (grilled pig jowl) at the Alabama Café. While we waited for our meal we studied the raindrop patterns and cryptic messages generously burned into the table cloth. 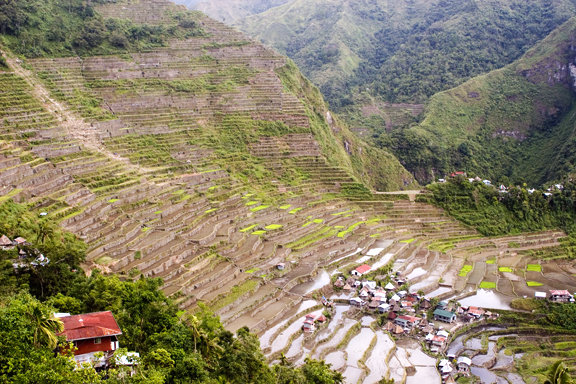 Many of the rice terrace plots in Batad were in disuse because the owners had left to seek a living outside of the village. Those that were farmed looked like swimming pools crammed with soft clay. Walking along the stone walls we spent a long time talking with our guide about our hometown of Las Vegas, his dad’s rendition of Elvis and of course Manny Pacquiao. After a bone jarring mototaxi ride, we made it back to the Las Vegas Restaurant for another round of homespun Elvis and dinner. 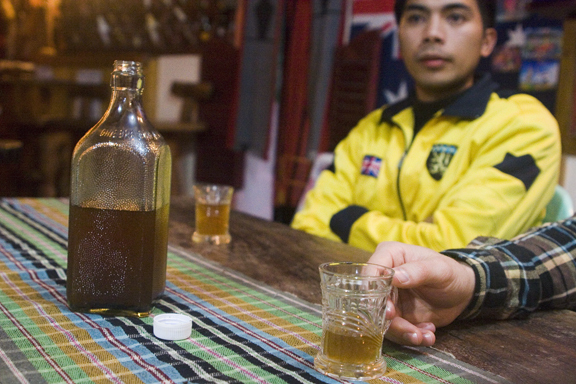 The rice from the terraces is not sold or eaten in restaurants, but it is possible to get a taste of the local grain by drinking it. The tourist information office sells giant bottles of it. Of course. Batad – From Banaue you can either catch one of the few daily jeepneys or split the cost of a private jeepney or mototaxi with other travelers. Don’t be surprised if local students ask for a free hitch on your jeepney! Seriously fascinating stuff! Obviously here is so much more to visiting the Philippines than I previously thought.